For readers of Kate Williams, Beatriz Williams and Jennifer Robson, a captivating novel of love and resilience during the Great War, inspired by the author’s family history. A very well-written historical drama. I enjoyed the story very much. Reminded me of the Titanic sinking and Downton Abbey. Was very impressed with all the historic information and detail. The love story was also very good. Once I started reading, I had trouble putting the book down. 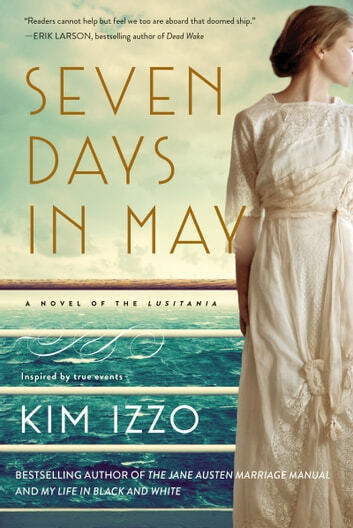 Kim Izzo's "Seven Days in May" is based on the singing of the British passenger liner "Lusitania" in May 2015. 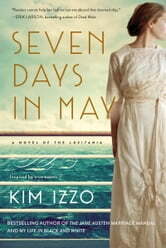 While most of the characters are fictional, Izzo's great-grandfather Walter, who survived the sinking, is portrayed in the book, as are a number of real-life people who sailed on the ship's final voyage. The novel weaves several stories throughout: Isabel, a British woman working for the admiralty, Sydney and Brooke, New York socialites traveling to Britain so Brooke can marry into a "noble" family, and Edward, the British noble engaged to Brooke. Their intertwined stories are compelling and make the novel very readable and enjoyable. A page turner...beautiful story that draws you right into see this period of history through the eyes of its characters. A little too Harlequin Romancey for me but well written and vivid. The book was well researched and I learned a lot about the sinking of the Lusitania, a topic that has always interested me. Really great read. The human story of the sInking of the passenger ship Lusitania in WW1. We read about 2 rich American girls onboard, an English nobleman who is marrying one of them to save his estate and other passengers in First and Third Class. And the story is about the code breakers in England who know what might happen.....but can do nothing. Churchill is involved in the story of the Lusitania. A really interesting story partly based on fact. Recommended. I just kept on reading.